The October 2011 release of the Apple iPhone 4S was accompanied by an avalanche of spam hoping to take advantage of the fanfare generated by the new and exciting product. The iPhone 5 is expected to do the same. Barracuda Labs honeypots have already captured some of these unwanted messages. One example originates from a spam message that had been sent out some time ago. It lists the sale prices of mobile phones from Apple, Blackberry and Samsung. The new email contains a subject that advertises unlocked iPhone 5’s. Soon another version of it appeared with the iPhone 5 included in the message body (shown below). Because it was delivered before Apple’s September 10th unveiling, neither of the new iPhone models – the 5C or 5S – are mentioned. This spam originated from addresses ending in .biz and .in and the reply address is at email.ua, a free email site in Ukraine. The likely goal of the sender is to gather email addresses to sell as marketing data or to begin an email exchange with responders and persuade them to purchase products that will never be delivered. Because no single marketing hook will work with everyone, spammers naturally try a variety. 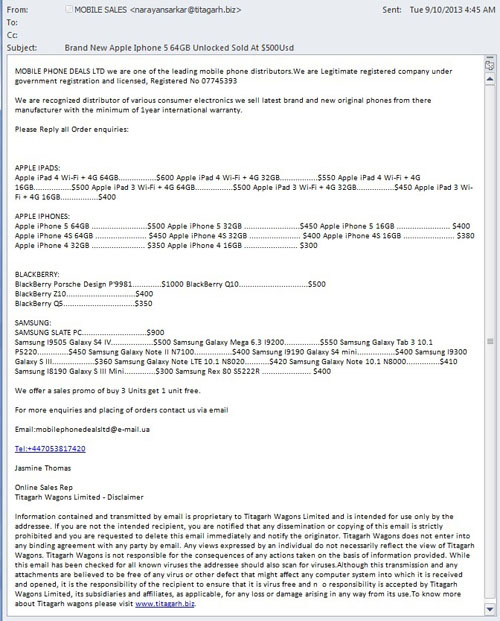 Another version of the message above has iPhone 4 and older models selling for ridiculously cheap prices. Marked as “overstock” they can purportedly be bought for as little as $40. Spam senders often add new wrinkles to old messages in a never ending campaign to fool people into taking a desired action. This approach is easier than creating something new and allows them to quickly get ahead of developing trends and breaking headlines. With more time, of course, they can produce completely new spam that is often better able to exploit the latest trends. Apple is releasing the versions of the iPhone on September 20th. As the date draws near, we can expect to see a more iPhone 5 spam with a variety of messaging and new hooks. Use caution and guard against an emotional response to product emails.